Undoubtedly, one of the first films that will pop into your mind when we say Sanjay Dutt, it would be Khalnayak! The actor imbibed the characteristics of this grey role in the Subhash Ghai film with aplomb and now celebrating his villainous stint will be another film. We are talking about Saheb, Biwi Aur Gangster 3 which will feature Sanjay Dutt in the role of a gangster. However, this one wouldn’t be any gangster but suave one wherein Dutt’s role would resemble that of a kingpin. His charm and suaveness don’t come as a surprise since Sanjay Dutt will be essaying the character of a royal in the film. We had earlier mentioned the same along with the fact that Kabir Bedi and Nafisa Ali will play his royal parents in the film. Chitrangda Singh, who is being associated with this franchise for the first time, will be his love interest in this thriller. 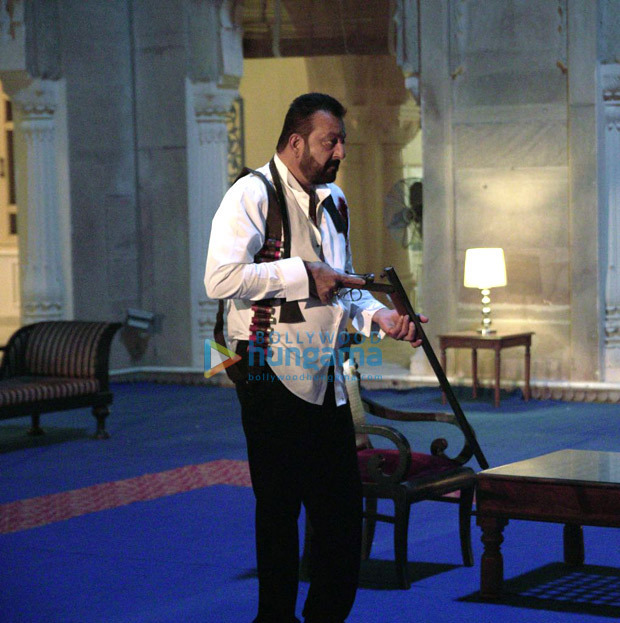 Amidst the recently released well-suited avatars of Sanjay Dutt, we came across this image wherein the actor looks equally menacing as he holds a rifle. The said picture only further reinstates his grey shaded role of a feared gangster. Besides him, the film has retained its earlier characters of Aditya Pratap Singh and Madhavi Devi reprised by Jimmy Sheirgill and Madhavi Devi respectively. The makers of the film have also shared a glimpse of Sanjay Dutt’s avatar on social media by releasing a motion poster of his character on the platforms. On the other hand, speaking on the film, it will also feature Soha Ali Khan in a cameo, who was a part of the second installment. The second part of Saheb, Biwi Aur Gangster ended with Soha becoming the wife of Aditya Pratap Singh. If reports are to be believed, Saheb, Biwi Aur Gangster 3 will take off from where the last instalment left off. Directed and produced by Tigmanshu Dhulia in association with Rahul Mittra, Saheb Biwi Aur Gangster 3 will release on July 27, marking the birthday weekend of Sanjay Dutt. The actor will be turning a year older on July 29.